Entertainment- Apple TV with internet streaming, Blue Ray CD player, free wireless internet, 40" flat screen TV in living area, 32" flat screen TV in master bedroom. Natural Beauty - Panoramic ocean views with abundant easterly meadow and forest views. You are in the midst of ever-changing displays of ocean, clouds, sunlight and fog. The environment provides natural habitat for a wide variety of birds and wildlife. Enjoy all from all rooms, especially the 2nd floor window seat. Serenity - Peace and quiet, where usually the only sound heard is the waves crashing at nearby Gualala Point. 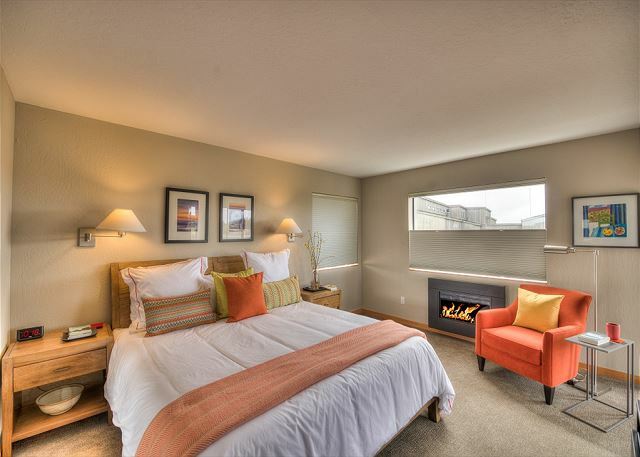 New gas fireplaces provide warmth and beauty to the living room and master bedroom. Both bedrooms have doors to the deck where you can take a dip in the hot tub - ENJOY! Recreational Activities - Easy access to miles of picturesque Sea Ranch bluff top and redwood forested hills trails, and secluded beaches. Complimentary access to all three Sea Ranch recreation centers, The Sea Ranch Golf Links, all just minutes away. 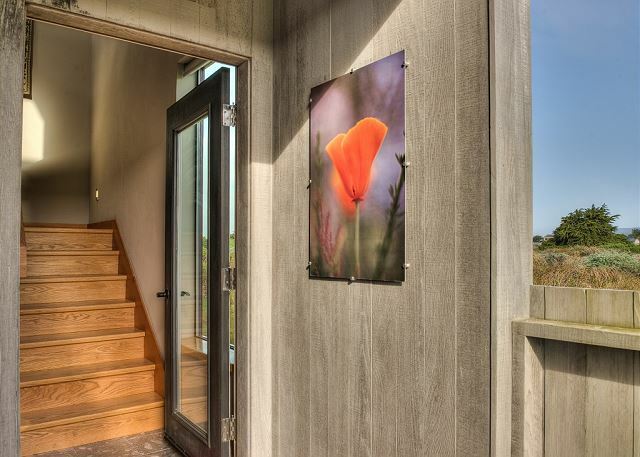 Poppy House is one of my absolute favorite Sea Ranch rentals. The decor is beautiful and updated, furniture well-placed and comfortable, great views in all directions, massive windows with the perfect shades if needed. Spacious, good hot tub, management excellent. When the BBQ didn't work right, a handyman was sent out within the hour to fix it in time for dinner. Lovely location in the north part of Sea Ranch. You must drive to the management office to pick up key, but it is close to the home. The home was beautifully decorated and very clean and very comfortable. Highly recommend this property! We had a restful, nourishing, fun stay here. Usually, we stay closer to Shell beach. This home is closer to Gualala which made for new, stunning bluff walks and easy hops into town for whatever. The fireplaces in the living room and main bedroom work really well to make the environment cozy. The situation of the house relative to sunrises and sunsets is perfection - I watched both from the deck. The bed and linens are very comfortable. The hot tub was clean. The kitchen is well stocked, including sharp knives. We were able to binge watch "The Crown" via Apple TV in the living room. Great getaway! We had not stayed at Poppy before. The house was very comfortable - kitchen, dining and living areas on the second story with great ocean views. Very peaceful. We headed to Poppy House in Sea Ranch to beat the heat, relax and play some golf. Really enjoyed the entire experience. The Sea Ranch golf course and Point Arena lighthouse were highlights Fireworks were the only thing missing on our 4th of July. We had a great long weekend at Poppy house with our two children. The house is modern, comfortable and well supplied. 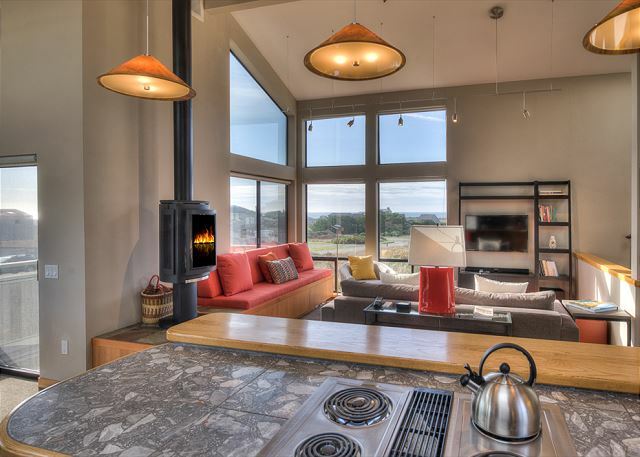 The main living area is open and airy with great views all around. No views from the bedrooms, as they are downstairs, but they are comfortable. The house is relatively small, but OK for two adults and two kids. My family of four had a wonderful stay at Poppy House. Views were even better than the pictures. The house was modern, well decorated and very clean. Kitchen was well stocked. It was the perfect perch for our long weekend getaway. The house is nicely appointed with comfortable and updated furnishings, and includes everything necessary in the kitchen. The only thing we found difficult was the Apple TV set up. It took about an hour to figure out how to connect the TV to my iPhone, download a few apps, and sync the TV & iPhone so that we could watch current weather & news. A very pleasant home and weekend getaway. Our family of four stayed at the Poppy House during the Thanksgiving was very comfortable, clean and has beautiful views of the ocean from the second floor. The kitchen was well-stocked and had everything we needed for cooking. The bedding was luxurious and the beds were very comfortable which provided great sleeping. DIdn't use the grill due to the rain. Enjoyed the gas heating stove upstairs in the common area. We plan on visiting again in the near future. Thank you. Another great house from Ocean View. Although the ocean view cannot be seen from everywhere in the house, it's a great location. A short walk to the bluff and to the golf course. The house is remodeled nicely, though the appliances are still original. Overall a great spot! The views and location of Poppy house make for great ocean enjoyment. The house is well supplied and well cared for, making our stay very easy and comfortable. Being close to the Bluff Trail makes for lovely walking or running right out the door. The folks at Ocean View Properties are helpful, and their rental procedure is very user-friendly. A great get-away for friends, couples, or small families. I would definitely pick this location again. Although the view is modest, the location is great, close to town and easy access to walking trails. The house was clean and in good shape. The kitchen had all necessary appliances and cooking tools. The furniture was comfortable and plentiful. There were lots of Windows and plenty of light. Highly recommended . One of the nicest of the many properties at which I've stayed at Sea Ranch over the last 20 years.